Shakira and Nikita. They love to be cuddled and stroked. Cheetah Experience, 2014. Shakira and Nikita are two female Canadian Wolves who were born in 21 June 2008. Riana got these two magnificent rescued animals from a farm in Hoopstad. These two are inseparable and made best friends with two lions with whom they grew up who have now left Cheetah Experience. They need to trust and know you before they would approach. Cheetah Experience is a big cat centre that was founded in 2006 with the long-term goal of breeding cheetahs. Their intention is to release them back into a 'protected wild', where they will be interfered with as little as possible by humans, yet will still be monitored closely by vets and researchers in order for us to gain better insight into the lives of these magnificent creatures. They focus specifically on raising awareness about habitat loss and insensitive farming practises, creating a sense of empathy and respect towards the animals, and emphasizing the fact that specifically cheetahs have larger predators to compete against. They educate visitors about making a difference together so that our children's children can see cheetah and other big cats in the wild and not only read about them in books and on the Internet. 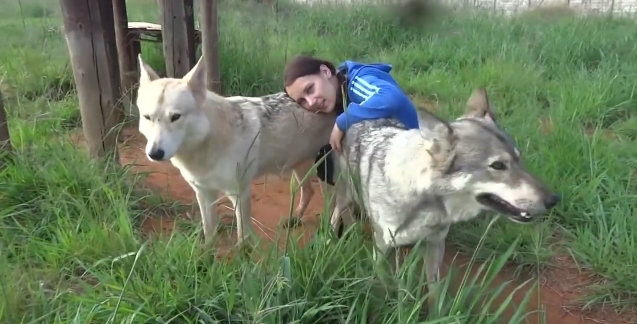 Responses to "Wildlife Caretaker Kisses and Cuddles With Rescued Wolves (VIDEO)"